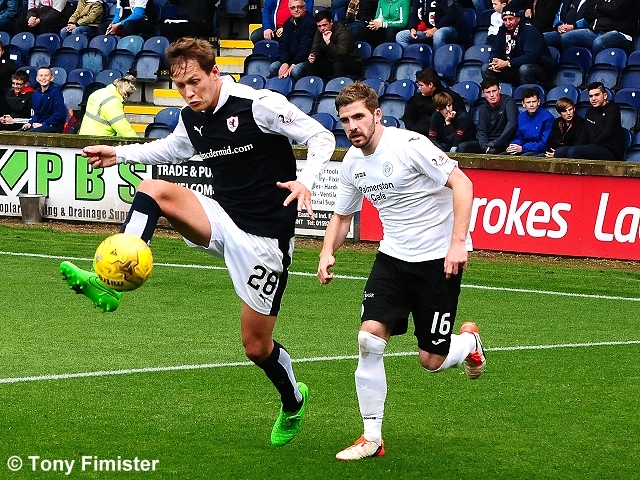 Raith Rovers made it five wins from five games at Stark’s Park this season, after they ground out a 1-0 victory over Queen of the South on Saturday afternoon. 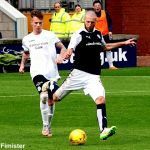 Manager, Ray McKinnon made one change from the side which went down to Rangers at Ibrox the week before, swapping Craig Wighton with Mark Stewart, after the youngster returned home after reporting for Scotland under-19 duty last weekend. 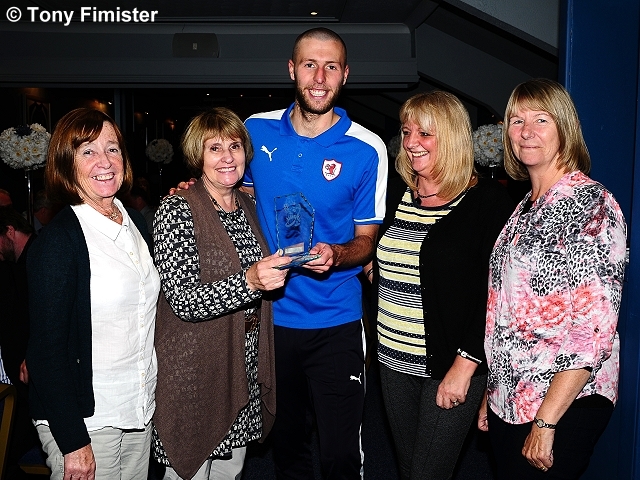 Queens’ had an ex-Rover in their ranks, with last season’s top-goalscorer, Ryan Conroy starting in a central position for James Fowler’s outfit. 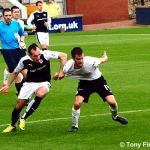 It was a fairly damp, dreich day as the match got underway, and whilst Raith initially dictated possession and enjoyed the upper-hand in terms of territory, they were struggling to create anything of note in the opening stages of the game. 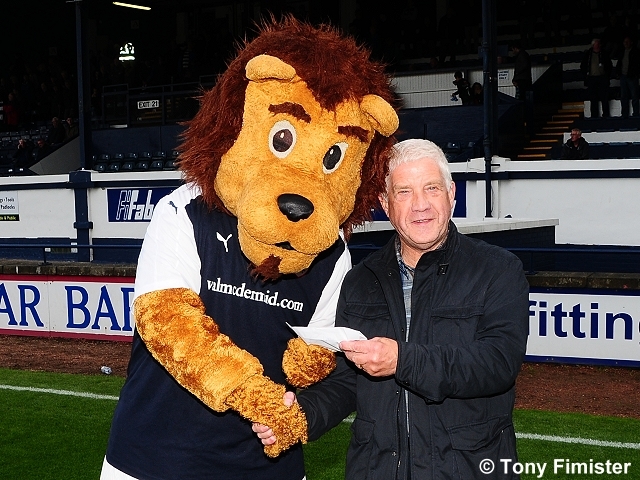 The only thing they had to show was a long free-kick to Jason Thomson, who had made ground down the right-hand side. His cut-back found Grant Anderson on the edge of the area, but his first-time shot was closed down and blocked by Andy Dowie. 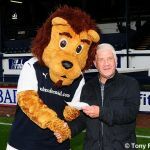 The next cross into the box was presented from the opposite side, when a ball from James Craigen was cleared away, with Jon Daly ready-and-waiting to strike. 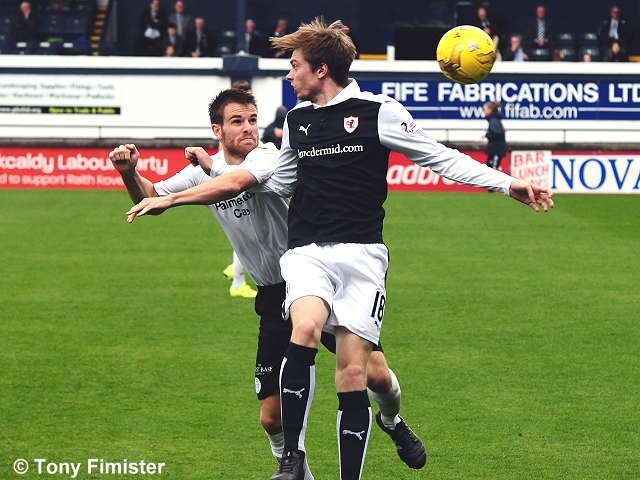 Raith had still to test Queens’ ‘keeper Robbie Thomson, although they probably should have done in the tenth minute. Anderson picked up a loose ball in the right-hand corner, but his cross into a busy penalty area was aimed a little deep. 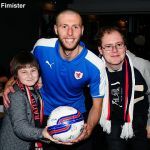 However, Rovers recycled the ball, and it eventually fell to Ryan McCord 22-yards from goal, but he pulled his shot wide of the right-hand post. 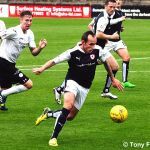 It’s often the case that moments like that can come back to haunt a team, and you wondered if that was going to be the scenario two minutes later, when Ryan Conroy eyed up a free-kick, just outside the Raith penalty box. 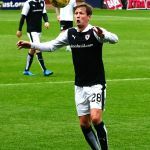 He demonstrated his dead-ball ability several times in a Raith jersey last season, and he almost did it again for his new team, but Kevin Cuthbert reacted well, getting down low to his left and palming away the effort. The home side have managed to score from several set-pieces of their own already this term, and they should have done so again after quarter-of-an-hour. 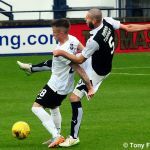 McCord’s delivery was flicked on by Daly, and although Lewis Toshney was only eight-yards out, he side-footed his opportunity over the bar by a considerable margin. The play swung from one end to the other, and 60 seconds later, new Queens’ forward Gary Oliver made a hash of the best chance of the game. 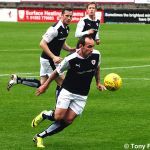 Darren Brownlie got forward from the right-back position, and swung a ball into the box towards Oliver, who headed wide after finding himself a couple-of-yards of space in the penalty area. By this point, the match had become very much even-Steven, with both sets of players occasionally struggling to keep their footing on a wet surface. 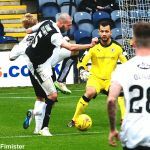 Although both teams were tidy in possession, neither brought a save from the opposition goalkeeper for the remainder of the half, although Raith fashioned out an almost identical chance to the one Oliver had earlier passed over. 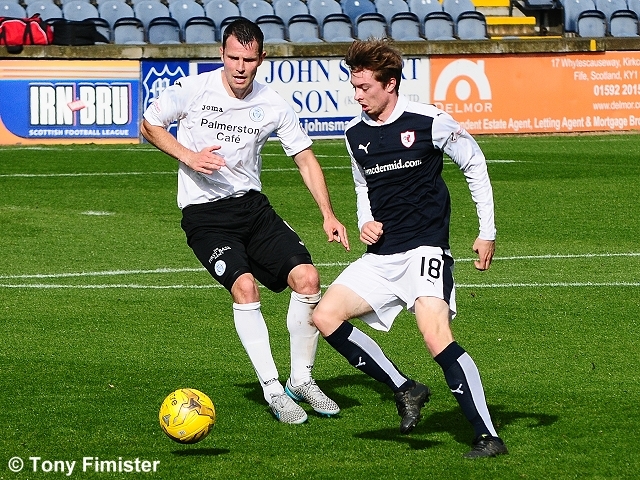 James Craigen picked up the ball in midfield and drove play towards goal, before releasing Rory McKeown, whose cross found his colleague from the opposite full-back position, Thomson. His cross was accurate enough to find Anderson in a good position in the area, but his header looped wide of the left-upright, with Thomson in the Queens’ goal, struggling to get across. 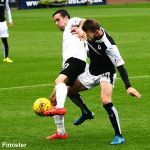 The last chance of the half fell to Rovers, when good hold-up play on the edge of the area between Daly and Wighton, eventually saw the ball being moved over to McKeown, but his first-time effort was blasted over. 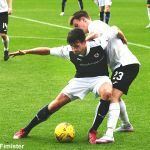 The second-period was only a few moments old, when Oliver once again gave cause for the Raith fans to panic, cutting inside from the left-wing, and smashing a shot that looked to be on-target, before drifting wide. 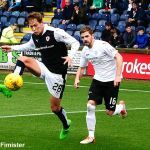 It was an early indication that the Doonhamers were keen to pick up the tempo in the second-half, and they had a loud claim for a penalty soon after, when Alex Harris’ flick into the area cannoned off Lewis Toshney’s hand, although referee, Kevin Clancy waved play-on. 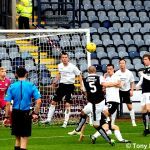 Kyle Jacobs then had a shot from distance that flew over, as Queen of the South continued to squeeze Raith back into their own half. 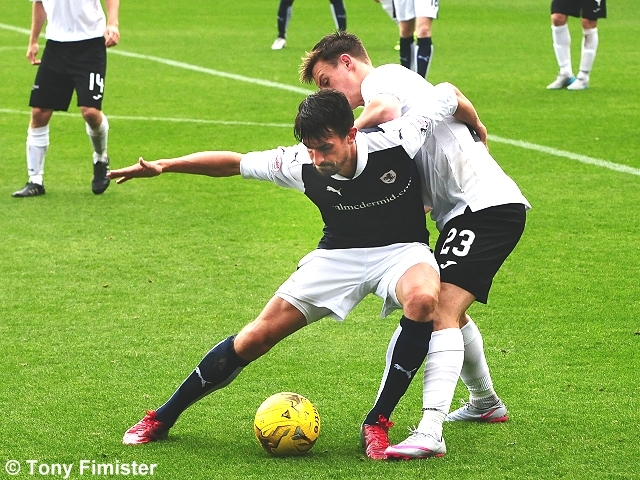 Perhaps sensing that the momentum was swinging away from Rovers, Ray McKinnon made his first change of the afternoon, replacing McCord with Mark Stewart, although if anything, it seemed to have a detrimental impact, as James Fowler’s side started to enjoy their best period of the match. Indeed, it took a sensational reaction stop from Cuthbert with 25 minutes remaining to keep the scores level. A corner kick was swung into the area, and was met well by Dowie, who must have thought his header was about to nestle into the back of the net. 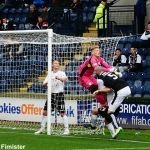 It certainly would have done, if the Rovers custodian hadn’t thrust up a hand and diverted the ball away, allowing McKeown to complete the clearance. 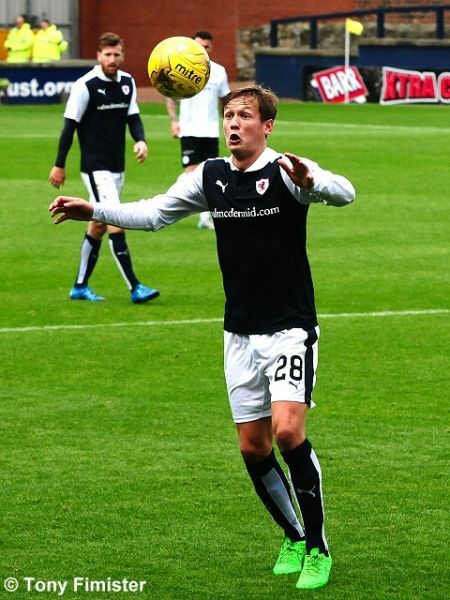 After 70 minutes, McKinnon made his second and third changes of the match, with Ross Matthews and Mitch Megginson being brought on for Grant Anderson and Craig Wighton, and within a minute, Rovers were ahead. Mark Stewart did well to win a corner-kick on the right, and while Craigen’s initial cross to the front-post was knocked back to him, his second attempt found Kyle Benedictus all alone on the edge of the six-yard-box, and he had the reasonably easy task of heading the ball home, for his third goal of the season. 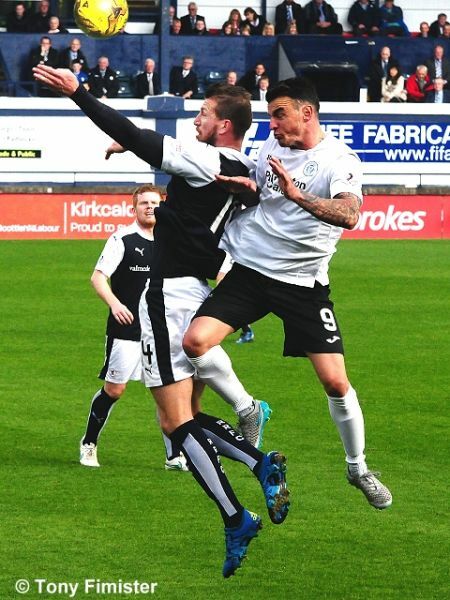 They almost made it 2-0 a moment later, but while Craigen’s cross was every bit as good as his earlier delivery, Daly’s downward header bounced over the bar. 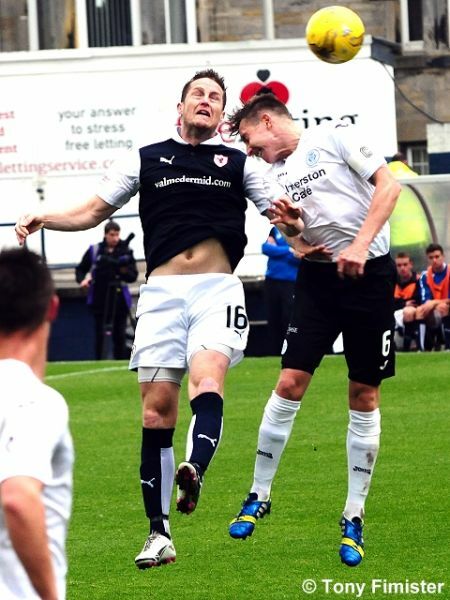 As the away side pushed forward for an equaliser, Stewart was almost put through with just Thomson to beat, but the son of the former Raith goalkeeper, Scott, rushed from goal, to send a clearance straight to Conroy, but his attempt at lifting the ball over Cuthbert from distance went badly awry. 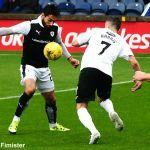 Queens had one last chance before the end, when Oliver cut in from the left once more, but while his shot appeared to be more accurate on this occasion, Toshney stooped to head to the danger clear. 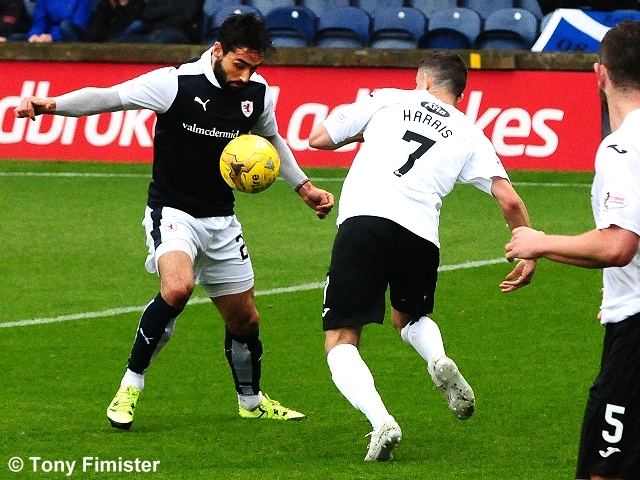 The win lifts Rovers up to fifth place in the table, and they’ll have the chance to go third next Friday, when they travel to Paisley to face St. Mirren. 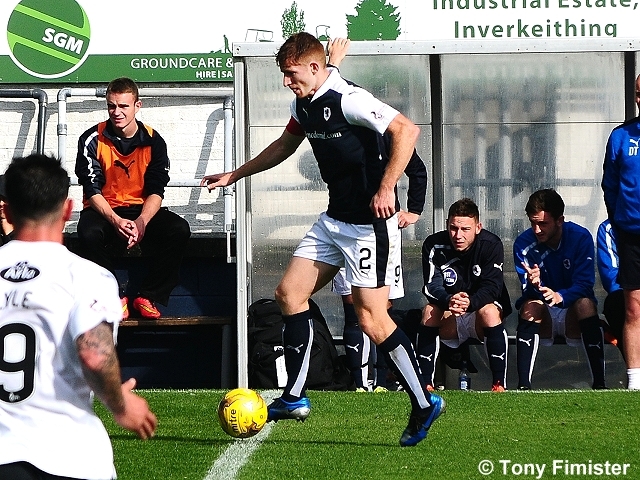 Welcome to Starks Park for today's Championship game against Queen of the South. Both teams will be looking to get back to winning ways, having experienced back to back defeats. It should prove an exciting tie. 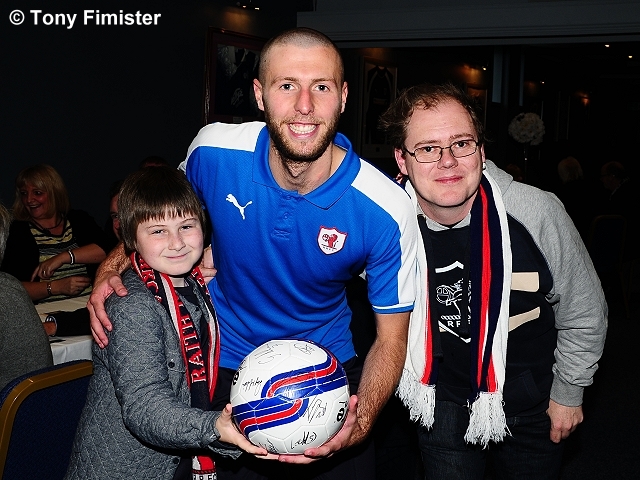 Today's visitors have a 100% away league record whilst the Rovers have captured maximum points at home this season. The rain seems to have stopped (for now!) but it's cold and windy in Kirkcaldy this afternoon. 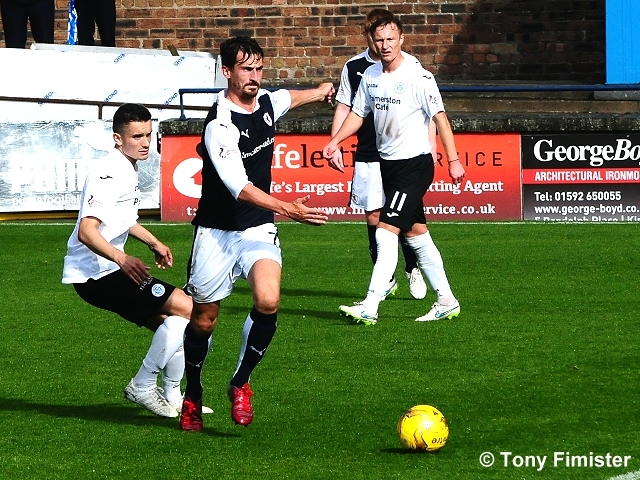 Ryan Conroy returns to stark park for the first time since leaving in the summer. 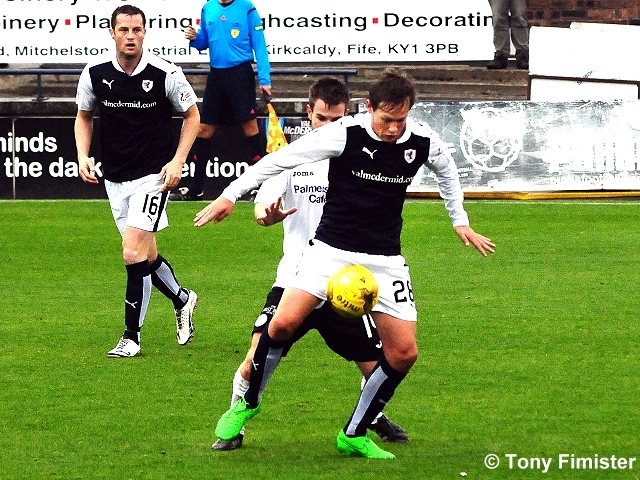 Jon Daly makes his first start at Starks Park as a Raith Rovers player. Spoke too soon, rain back on! 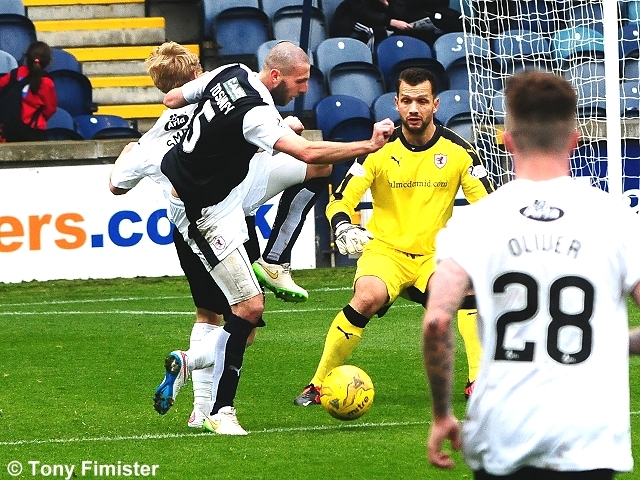 Late challenge by Oliver on Toshney results in an early free kick to Raith. Shot by Grant Anderson blocked on the edge of the box. The rain is fairly coming down now! 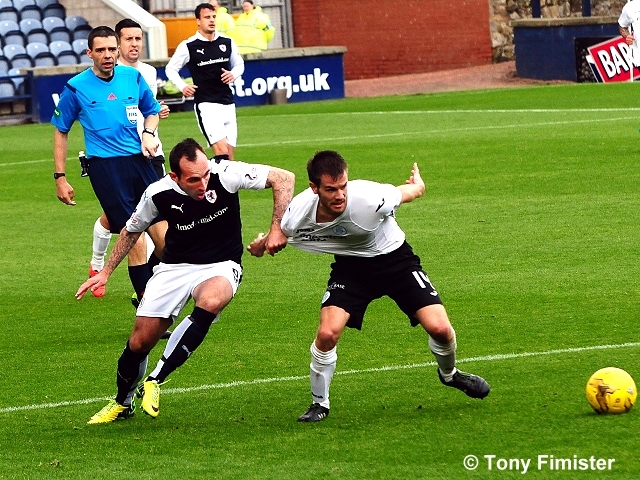 Ryan McCord shoots harmlessly wide from the edge of the box. Free kick to Queens on the edge of the box after a foul by Toshney on Oliver. Conroy takes it and it is well saved by Cuthbert, low to his left. 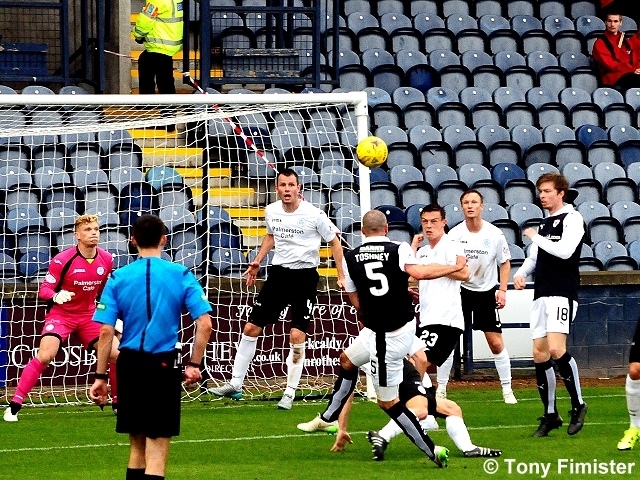 Toshney, free just outside the 6 yard box blazes McCord's corner over. 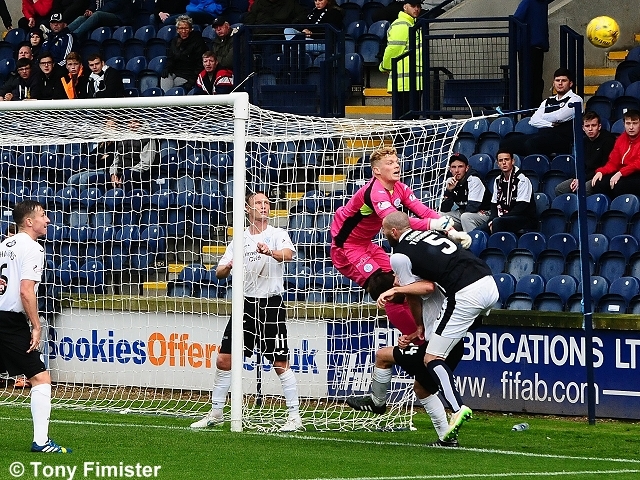 Oliver, free in the box, sends his header wide of Cuthbert's goal. 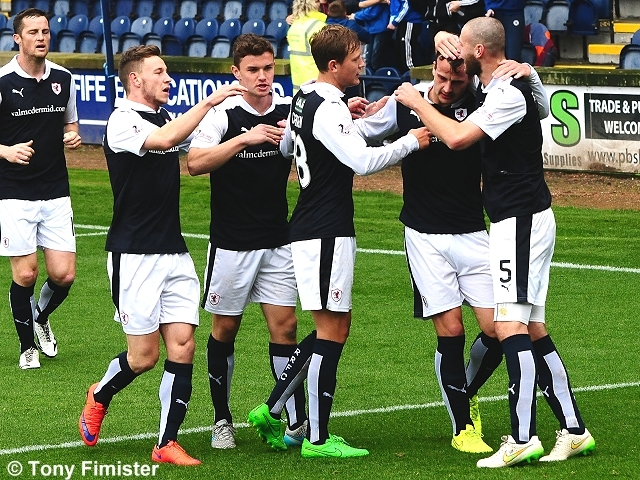 Good challenge by Davidson sends Raith on their way but they find their path blocked by the Queens midfield. 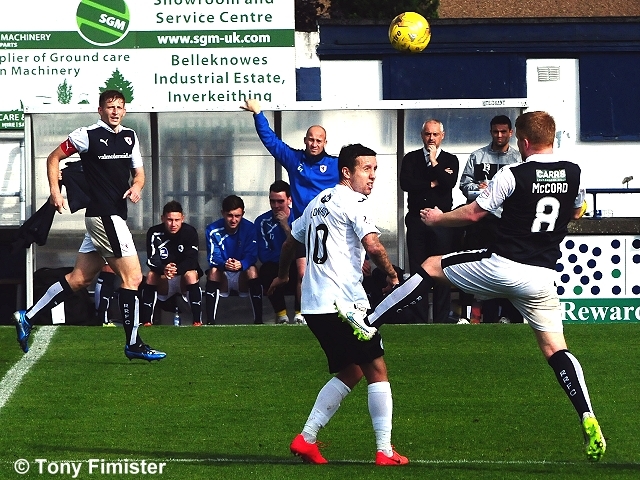 That man Oliver again, wins a free kick in the centre circle after a foul by Davidson. An Anderson header is inches wide to Thomson's left hand post. 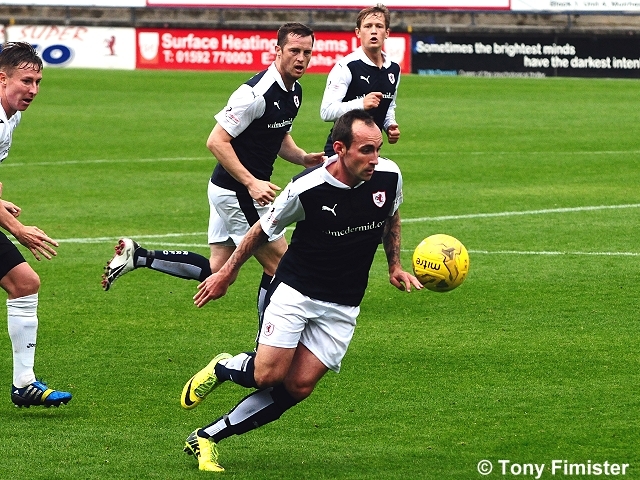 Conroy wins a free kick on the edge of Raith's penalty area. Lyle sends the free kick over the bar. A few players are slipping with the wet conditions. 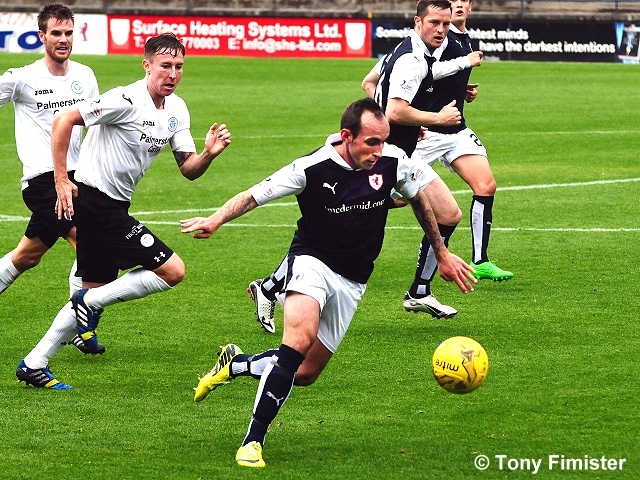 Oliver with a run into Raith's box is well intercepted by Thomson. 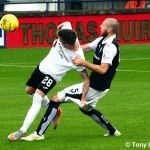 Booking for McCord for a challenge on Lyle. The referee stops play to have a chat with the rovers manager. 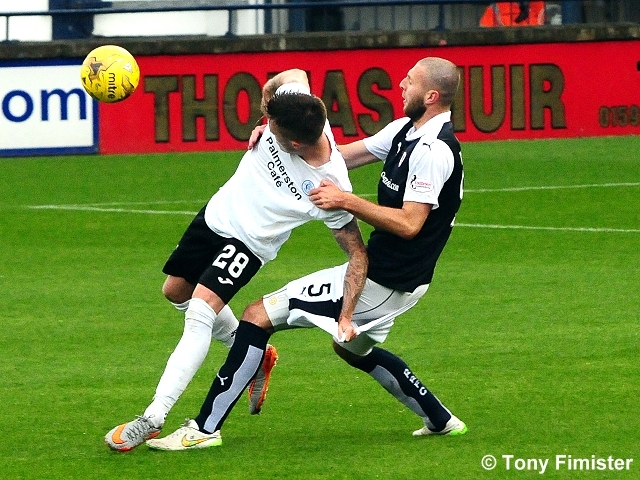 Correction, the foul was on Russell, not Lyle for McCord's booking. 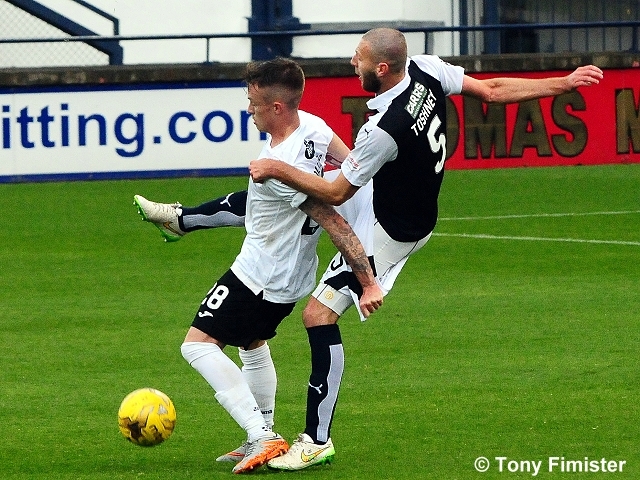 The game is evenly balanced at the moment, with both sides having had 4 attempts on goal. Only one of those efforts, the Conroy free kick, has been on target. Thomson is brought down near the far right corner after a surging run. Free kick comes to nothing. Queens win their first corner. 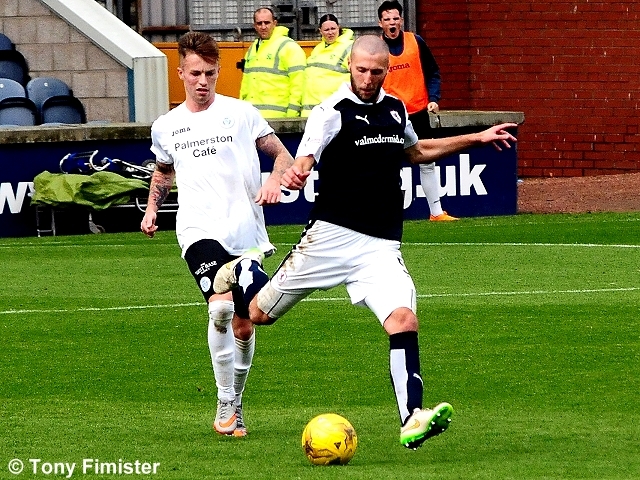 Conroy flights it in but Dowie's header is saved by Cuthbert low to his left. Half time. Both teams evenly matched in the first 45. 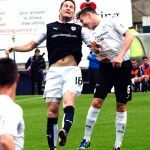 After two defeats to the Championship favourites over the last two weekends, Raith Rovers will hope to get back to winning ways this Saturday, when they welcome James Fowler’s Queen of the South side to Stark’s Park. 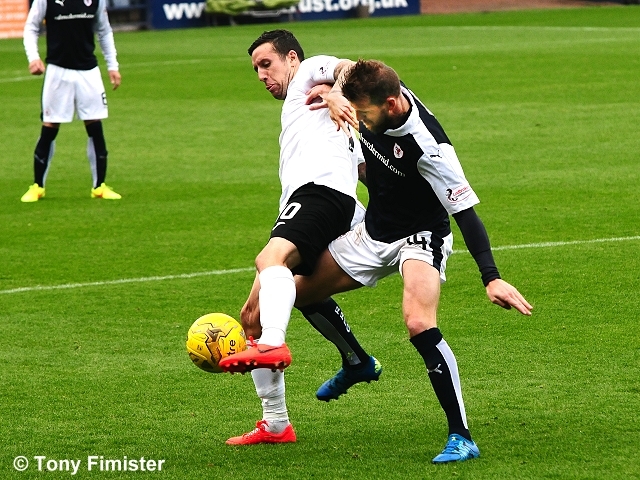 Queens have made a fine start to the season, and currently reside in third place in the league table, although Raith have a 100% home record this season, a sequence which includes a victory over Premiership high-flyers Hamilton last month. 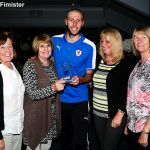 James Fowler was forced into a sizeable rebuilding job over the summer, after a number of clubs swooped for the players who did such a fine job of leading the Dumfries club to the play-off’s last season. 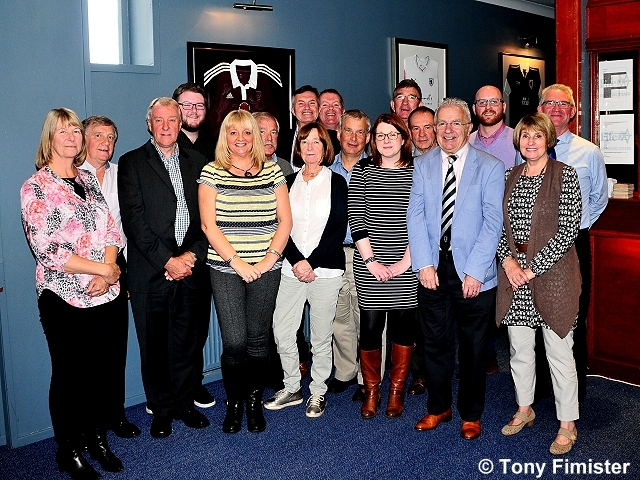 This led to the loss of stalwarts such as Mark Durnan to Dundee United, Gavin Reilly to Hearts, Kenny Holt to Dundee and Danny Carmichael to Hibernian. 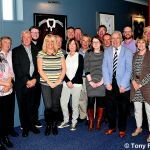 However, the affects of this have been offset with the arrival of no-less than 14 players at Palmerston Park, including former Hearts striker Gary Oliver, ex-Dundee forward, Paul Heffernan, and last season’s top- goalscorer at Raith Rovers, Ryan Conroy. However, it’s possibly been the signing of teenager, Jordan Marshall who has caught the eye the most from this season’s crop of acquisitions, with the 18-year-old making an assured start to his senior career at left-back, after leaving Carlisle United. 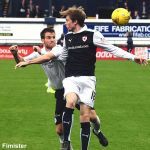 While Raith have a fine home record this season, Queens have an equally impressive record on their travels, with two wins from two after trips to Dumbarton and Livingston. 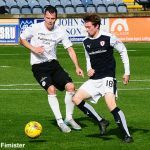 They also took nine points from twelve from the four league meetings last season, although Rovers did win the last of those, after a double from Mark Stewart and a Lewis Vaughan goal led the Kirkcaldy side to a 3-0 win in March. 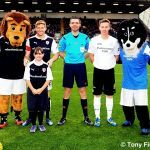 Queen of the South lead the recent head-to-head figure, with six wins from the last ten meetings, compared to Rovers four, and you have to go back a long way to find a draw between these two teams, 17 games and five years ago to be exact, when they battled to a no-scoring stalemate at Stark’s Park in April 2010. 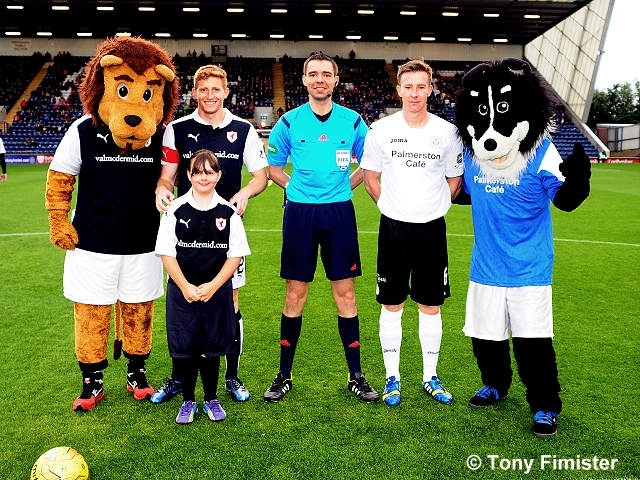 Saturday afternoon’s match referee will be Kevin Clancy.